I do realize there's been a big lack of posts on my blog lately, but I've been a bit occupied with other things and didn't get the chance to take pictures of my outfits. Hopefully from here on out I'll manage to post in the same manner as I used to, which was at least every other day. Must get back on track. Anyways, I went for more of a casual and comfortable look, as I've been doing so lately. I think the cold weather's exhausted me a little. These jeans are extremely comfortable. I have such great love and attachment to this bag. Although I may not use it much, it comes with some fun memories: it was the first item I've bought in a market where I bargained and managed to get a discount, it was in Florence and I was with a dear friend. Your sweater immediately drew my eye - did your Mum hand knit it? Such a special piece to have, and the perfect antidote to a bit of chilly weather fatigue! I always find that life gets in the way of blogging, especially if you're busy all day, and it's dark when you get home. There are only so many outfit pictures I can take in my living room. Love the bag and the jeans! Have a great weekend!! You have gorgeous hair my dear :) Great post! Love this outfit. 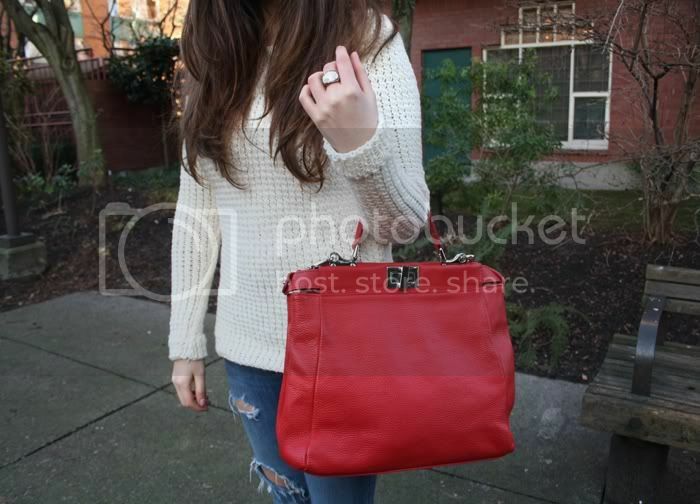 Love the jeans and red bag! Bargained items are always great. wow, you look super great. Nice blog :) I follow you now. 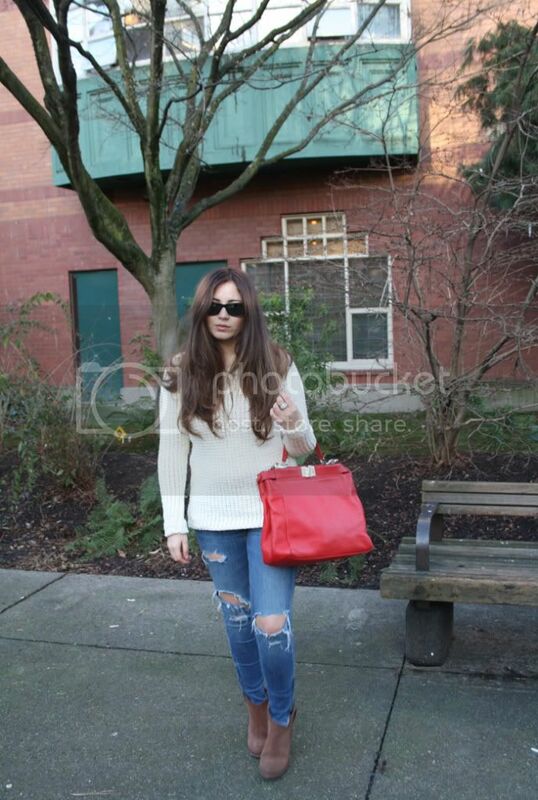 loving the torn jeans and the bright red bag! hallo honey! i love your blog!! Love the casual outfit! Your hair looks great btw! you look beautiful, very casual chic. that bag adds the perfect pop of color.